Aug 19, 2013 - N.A. Cyprus’ sick banks have received some emergency doctoring, but investors may find the bitter pill hard to swallow. Some unfortunates stand to lose 40 percent or more of their entire savings as part of a €5.8 billion plan to rescue the island nation’s collapsing financial sector. That’s the equivalent of $7.2 billion. 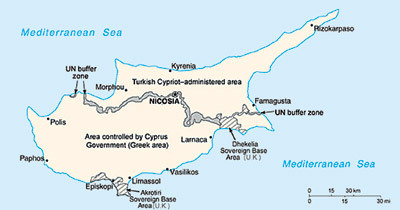 Cyprus is partitioned into two territories the area under the effective control of the Republic, comprising about 59% of the island’s area, and the Turkish-controlled area in the north, calling itself the Turkish Republic of Northern Cyprus and recognised only by Turkey, covering about 36% of the island’s area. The international community considers the northern part of the island as occupied territory of the Republic of Cyprus by Turkish forces. The proposal led to mass protests across the country and was ultimately voted down in Cypriot parliament on March 19. 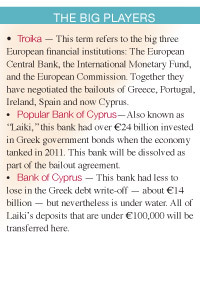 This plan was part of a desperate bid to rescue Cyprus’ two main banks, the Bank of Cyprus and the Popular Bank of Cyprus (also known as “Laiki”). Both banks have been struggling with massive losses ever since the Troika restructured Greece’s government bonds in 2011. In order to receive a €10 billion bailout of the economy, the European Central Bank dictated that the Cypriot government would have to raise an additional €5.8 billion. The new solution, proposed on March 22, would protect smaller depositors with savings of €100,000 or less, in accordance with EU law. But deposits above that amount are up for grabs. 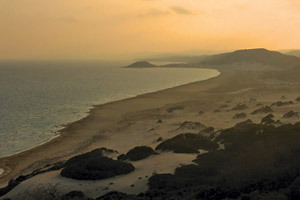 Cyprus agreed to dissolve Laiki entirely. Deposits of less than €100,000 will be transferred to the Bank of Cyprus, and uninsured deposits of over €100,000 — approximately €4.2 billion, according to The Economist — will be put into a “bad bank” and used to pay off debts. 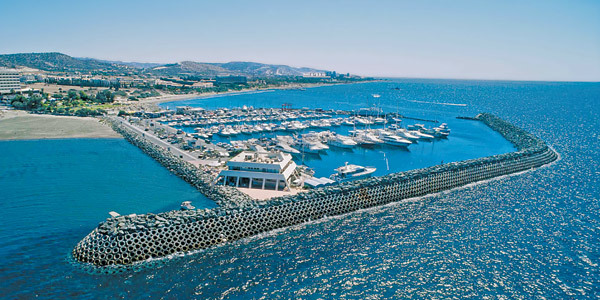 Those depositors, mostly wealthy Russian who have used Cyprus as an off-shore tax haven for years, will lose about 40 percent of their savings, if not more. The larger uninsured deposits in Bank of Cyprus, on the other hand, will receive a “haircut” of approximately 35 percent. One reason for Cyprus’ devastation is that the banking sector is eight times the size of the country’s GDP; when Laiki and Bank of Cyprus’ investments went belly-up, the government was unable to use its own funds to bail them out. According to Reuters, Bank of Cyprus had about €14 billion dollars invested in Greek debt in 2011, and Laiki had over €24 billion. The country has also introduced capital controls in order to prevent bank runs, which were extended on April 14, and again on April 26. These controls included limits on how much cash citizens could withdraw per day — €300, to be exact — and limits on bank transfers. For example, depositors can only transfer €3,000 per month between domestic banks, and transfers may not be between one individual’s two accounts. The capital controls are currently scheduled to last until the end of the summer, though many are skeptical that they will be removed even then; Iceland, for instance, imposed “temporary” capital controls when its economy took a downward turn in 2008, and has yet to lift them. Though government officials have relaxed the capital controls multiple times since they were first imposed on March 26, the €300 daily limit on cash withdrawals remains in effect. On April 25, the capital controls were relaxed yet again. Companies can now transfer up to €500,000 abroad with no restrictions but still need approval for deposits of higher amounts. In addition, individuals can transfer up to €5,000 a month—up from just €2,000 previously—and Cypriots going abroad can now take €3,000 with them. Some, like Maltese Finance Minister Edward Scicluna, protest that Cyprus is being unfairly bullied due to its small size. “[Cyprus] is a case study of how an EU micro-Mediterranean island member state is expected to be treated if ever its unfortunate turn would come to seek aid from its fellow member states,” Scicluna wrote in The Times of Malta. Malta and Luxembourg both have banking industries comparable to Cyprus’ and see its treatment as a red flag. The Eurogroup said in a statement that one condition of Cyprus’ bailout will be downsizing the financial sector over the next five years to reach the EU average, which will help prevent the banks from becoming too big to bail out again. Gerry Rice, director of the IMF’s External Relations Department, refused to rule out applying this same bailout model to other nations in the Eurozone, though he did imply that such a method would be unlikely. “I think the case of Cyprus was very complex and unique in nature,” Rice said in a press briefing. “It would be difficult to extend the case to the rest of Europe or to the world.” Many point out that the creation of capital controls and the “bail-in” (where investors are responsible for part of the rescue funds) negate the idea of a single currency; put bluntly, a Euro in a Cyprus bank is currently worth less than a Euro in a bank in Berlin. This could, columnists argued, lead to investors drawing their funds from banks in other at-risk countries like Greece and depositing them elsewhere in the Eurozone, like Austria. But it would seem that this is not yet the case. According to the ECB, household deposits increased in Portugal, Italy, Ireland, Greece and Spain—the notoriously precarious “PIIGS” nations—for the month of March. In contrast, bank deposits in Cyprus dropped by 3.9% in the same month. In the long term, however, Cyprus’ lucrative banking industry is no more, and the capital controls are going to be in effect all through tourist season, which could further impact the economy. Are Germans “Poorer” than the Cypriots?